Listening to a recent parent endorsement provided for a national campaign on innovation in the classroom, I reflected on our practice that cultivated such a warm regard for the work being advocated within our small community school. A key component to providing a high quality preschool experience for young children is cultivating a deep and meaningful relationship with each child and with each child’s parent. The parent is the child’s primary caregiver- the primary teacher. Developing a respectful and honest open communication rapport with each child’s family translates through to that child’s daily interactions with her teachers at school regardless of the child’s age. 1. THE WAIT BEFORE THE WAITING LIST – Prior to touring the program, parents or children infancy-two years of age first attend a New and Expectant Parent Class. 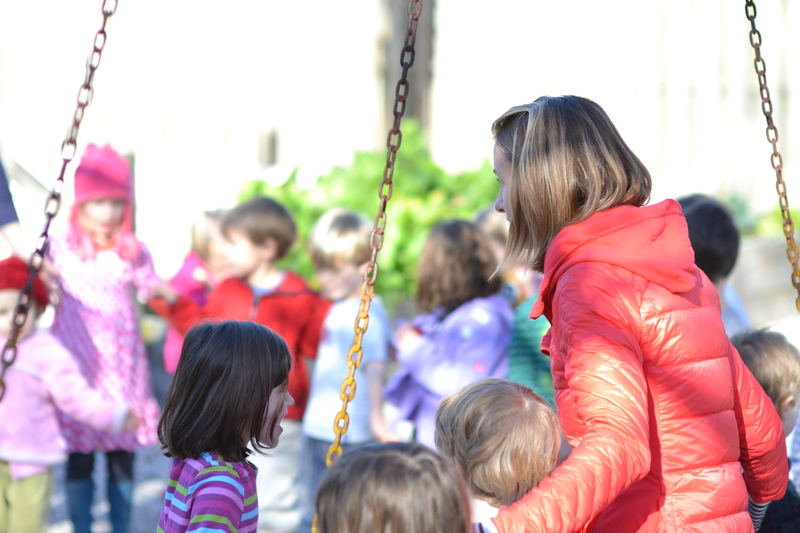 This class is held the first Saturday of each month from 9am-11am during which time we share components of child development, philosophical ideas, demonstration of care, and tour the school environments. More importantly, we are able to meet a small group of interested families and share with them our values, beliefs, and practice in a way that allows them to dissect the information with their own values, beliefs, and practice. Families of older children have a similar experience via quarterly OPEN HOUSE offerings. 2. BOTH PARENTS ATTEND AN INDIVIDUALIZED TOUR – Having both parents available during the individualized tour sends a powerful message. Regardless of who may be dropping off or picking up, parents share equal responsibility in a child’s upbringing and have different perspectives in regards to their care and education. Single parents are invited to extend the tour invitation, if they like, with extended family members or involved friends. In the event of a divorce, both parents are encouraged to come together at this time of assessment if custody is shared. For our part, we ensure that our time together is uninterrupted, unhurried, and individualized. The time we spend initially provides the foundation of communication for our possible future relationship should the family choose to enroll. 3. CULTURALLY SENSITIVE MATERIALS – Examine your paperwork for un-intentioned social biases. Better yet- have a colleague look over your registration, application, and school handbook and materials for an objective take. Deborah Solomon, President of Resources for Infant Educarers, remarked during a certification visit almost innocently, “Do you think asking for the name of the Father and the name of the Mother on your application may be offensive to some parents?” That simple question opened my eyes. We have to develop a practice of inclusiveness not only to our current parent body but also with a sensitivity to families yet to embark on our journey together. Imparting a sense of belonging and understanding trickles down to the minute details. Sample Preschool Application – Can you find any biases in this sample application? 4. THE WARM-IN – Before a child separates from their family to join us at school, a series of visits ranging from 3 days to one week (depending on the child’s age) facilitate the child, parent, teacher bond. 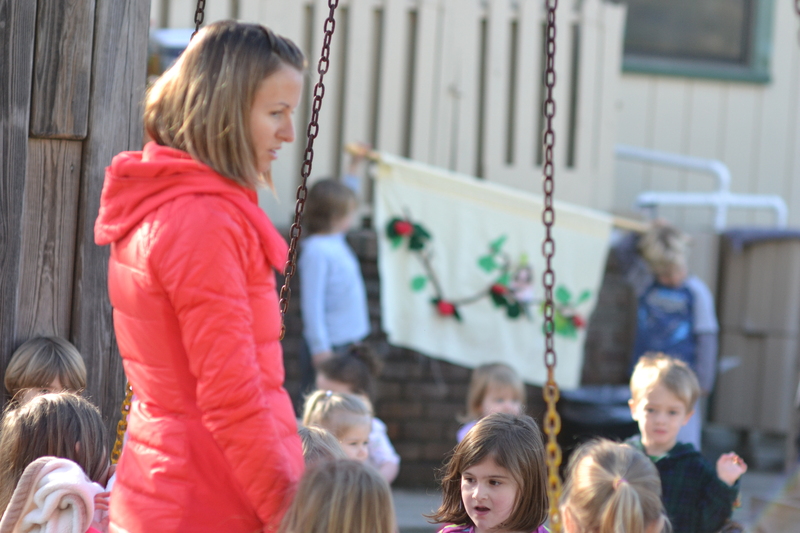 During this time, parents are welcome to look on as their child begins to engage in play and with classroom materials. Teachers are freed to remain close-by connecting and learning individual family culture. Together they share their thoughts, ideas, and hopes for our coming years together. 5. 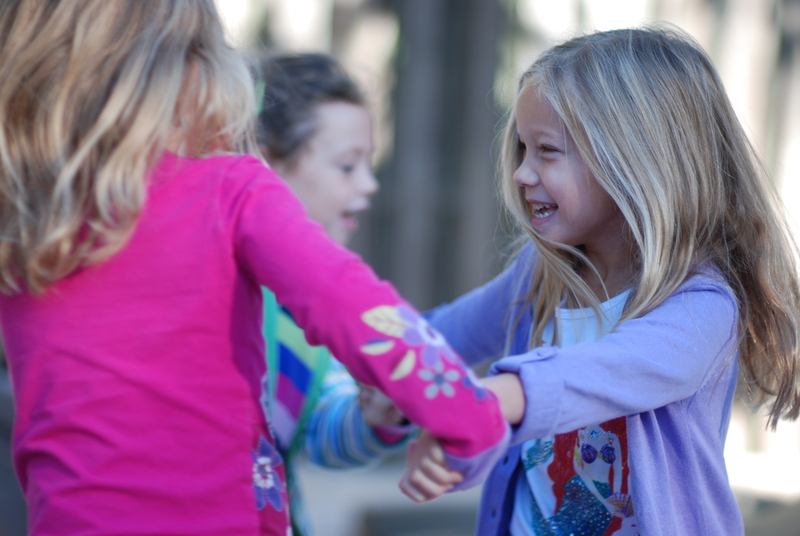 COMMUNITY MEETINGS – Time is afforded on a monthly or quarterly basis inviting parents and teachers in each classroom to come together within their classroom while their child is in the supervision of a secondary caregiver at play. 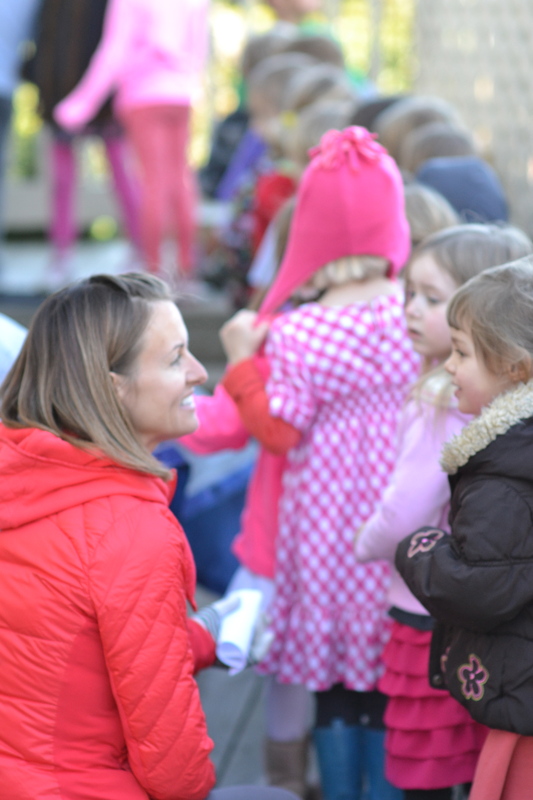 Parents are able to connect with other families and together discuss topics relating to child development, classroom experiences, and time at home. Attendance in regular community meetings also affords parents an opportunity to deepen their understanding of their individual child’s potential during individual yearly parent teacher conferences. Children bare witness to the adult interactions amongst them. They are absorbed and integrated providing useful learning experiences upon which the child will interact with his friends and teachers throughout the day. When parents feel acceptance and belonging, so, too, will their children. 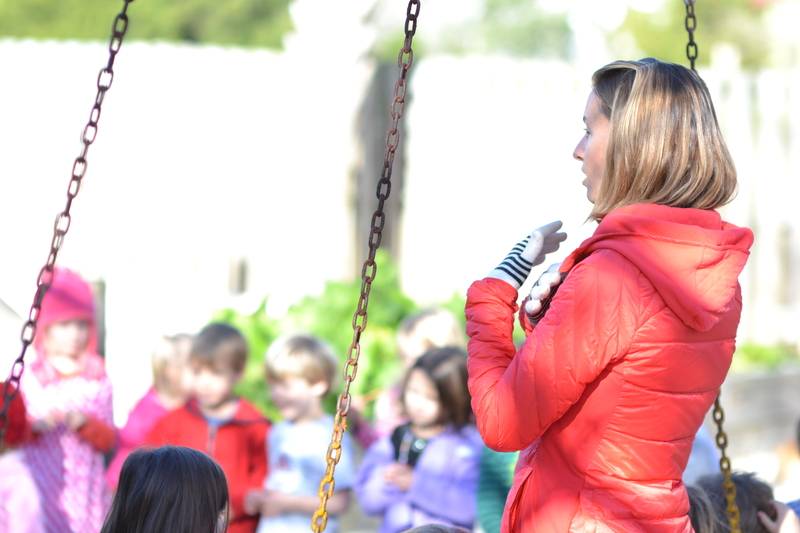 Last week working on a video presentation for a GATO grant and taking the Stanford 10 with our soon-to-be graduating Kindergarteners took us out of our daily routine administratively. One morning as we were about to start our day, talks of the two experiences converge to meet at a defining point. The topics: What Tip Would You Give to Teachers Across America and The Standardized Test. We gleaned 90seconds from our fifteen minute talk together: In this video, Megan shared the story of one standardized tested child contemplating how to determine the number of apples on a tree. 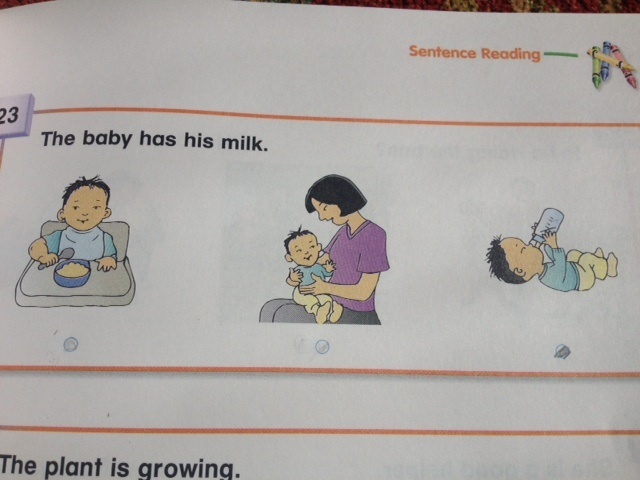 During the test, Megan noticed that the child was perplexed on a question which seemingly appeared easy. Following up, the student explained her thought process- on a real tree you wouldn’t be able to tell just by looking as some apples may be hidden behind the leaves. Understanding the critical thinking tools a student uses to arrive at an answer provides just as much- if not more- information than the score he may receive from a test. The question presented: A picture of a fish jumping above a flowing stream of water. What is the beginning sound. Now, the teacher knows that the child has mastered beginning sounds and looks at the “wrong” answer puzzled. Having a rapport with her student, she casually brings up the topic at lunch. “Well,” Lucy explains, “Since the fish was swimming upstream, it’s obviously a SALMON.” And thus, her score will be negatively affected. One Kindergarten boy, who recently welcomed a his new baby brother into the family, was presented this question. The baby has his milk. His mother’s heart warmed at his choice (B) – also the “wrong” answer for the standardized test, but certainly the right choice for their family. The experience of taking the standardized test has been a wonderful experience at our school, providing not only an accounting for a child’s academic understanding, but also a glimpse at each child’s critical thinking skills. Standardized Test results are only a small part of a larger picture. When children are taught to arrive at the same answer- when teachers are rewarded by scores creating a standardized thought process- therein lies the danger. 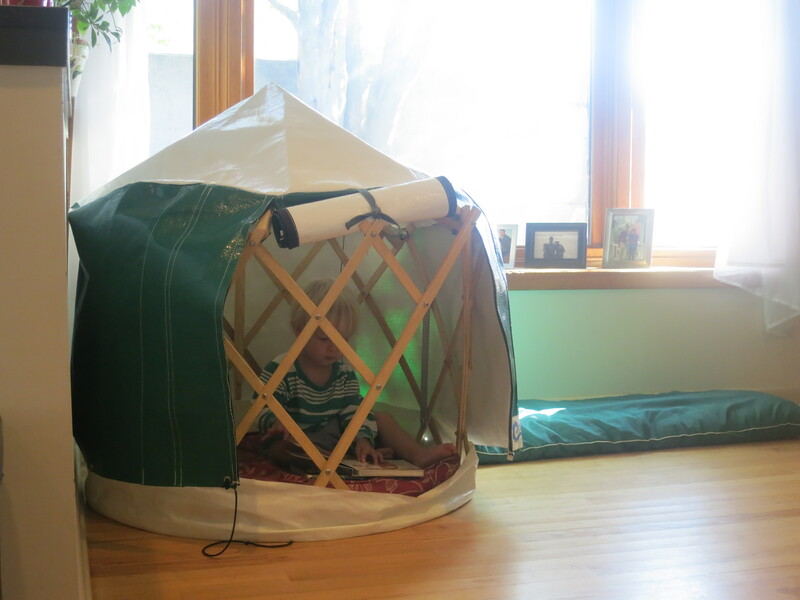 Many times parents feeling pressured to set up their home environment often ask, “Where do I purchase Montessori materials for our house?” I reassure them- it is not necessary to have your home environment mimic the classroom. As a Montessori certified primary teacher, I promise my children’s rooms are not fully equipped Montessori mini classrooms. 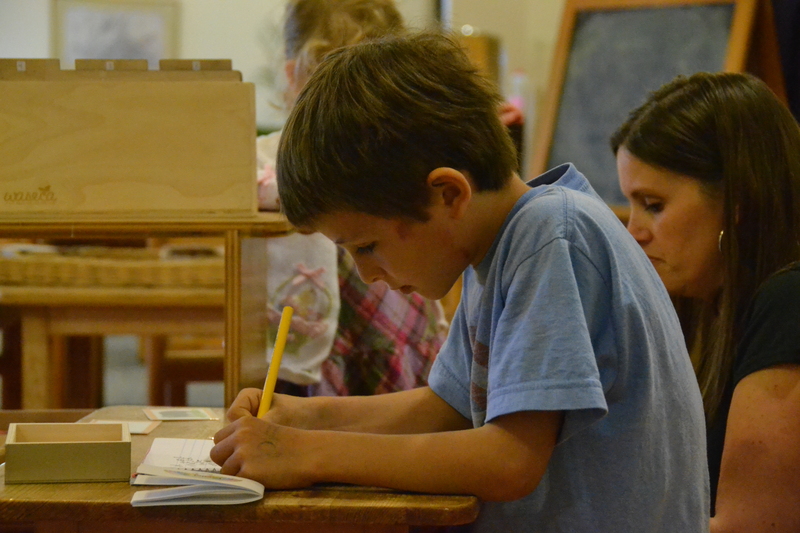 The basic concepts of a Montessori classroom, however, can easily be duplicated at home. Simply put- there is a place for everything and everything in it’s place. The external order will cultivate your child’s inner order. Build in opportunities for your child to participate in the care of his home environment and in self care. Basic discipline expectations center around respect of self, others and materials. 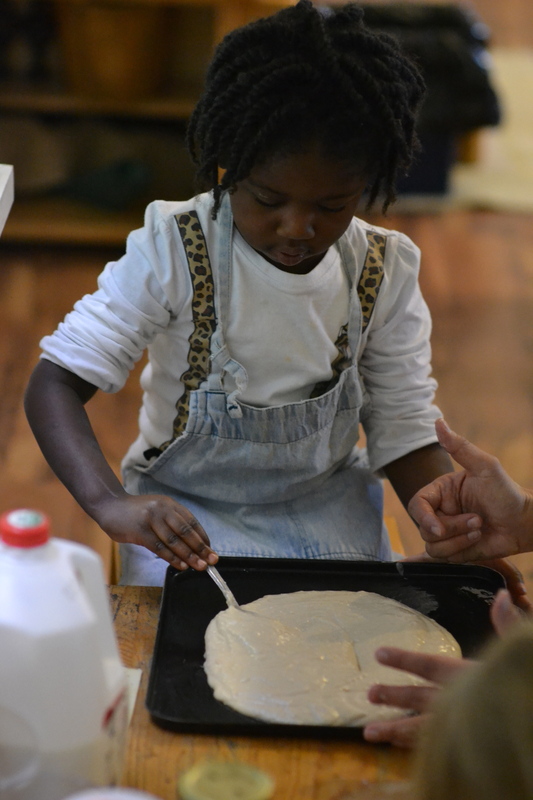 Montessori materials extend beyond the cognitive works designed by Maria Montessori and, in fact, a child’s success working with the specially designed Montessori curriculum greatly depends on how deeply his care, order, independence and coordination have been cultivated in Practical Life and Sensorial. These curriculum areas can easily be adapted at home. 1. A child friendly TOOL BOX equipped with hammer, small nails/tacks, duct tape, screws, and safety gear (adult and child size). 2. Child friendly kitchen spaces allow your child to participate in meal preparation independently. Vegetables are a great first start and the space should include peelers, bowls, mixer, cutting board, child cutting tool, scrubber, pitcher, and toaster oven. Don’t forget the environment with clean up materials as well. 3. A small box garden with soil, seeds, watering can, and spade. 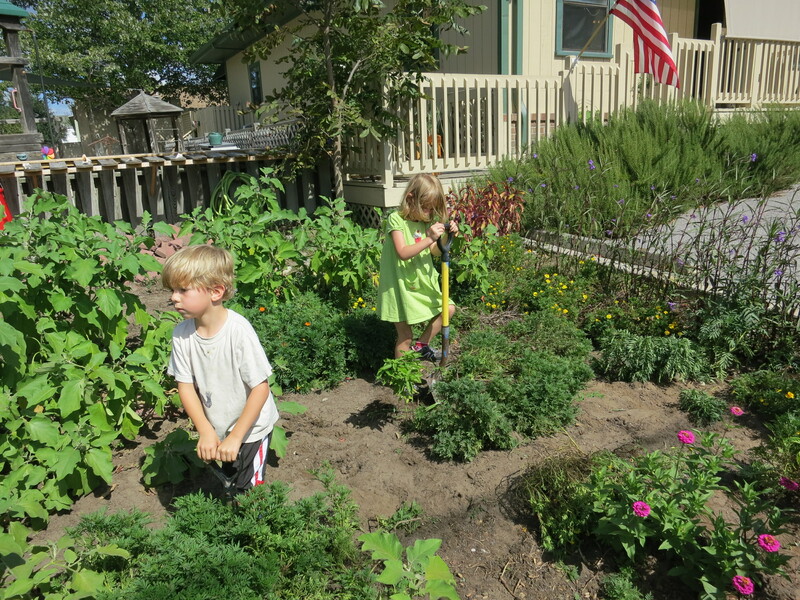 The garden directly ties into the Home Kitchen environment and can extend as far as the parent is willing to include worms, composting, and winter indoor sprouts. 4. A first aid kit for your child complete with mirror, tissues, thermometer, wipes, and band aides. And our “go to” places include Amazon (search “waldorf” for toys) and Etsy for unique objects. Or follow us on Pinterest for what is inspiring us as we continued to build upon our school environment. When asked to present a 90 second clip on How Megan Nordoff Has Made a Difference, well- where to start? 90 seconds simply isn’t enough time to speak on the many ways Megan has made a difference in the daily experiences possible at the early childhood level, to educating parents and providing them necessary tools of support in their child’s education, and in extending her knowledge and expertise outside the school’s facility walls. Speaking directly to Megan on the topic, I’m met with a blush. Obviously, she is uncomfortable with the idea of being singled out as a Difference Maker- not surprising coming from a leader who insists that she is only one small part of the larger picture. Oh, but what pictures do tell of her contributions often left unspoken. With care, together we chose a few of our most meaningful moments- ones we thought best conveyed the difference Ms.Megan is making not only with the children with whom she has a daily relationship, but also with their extended community- parent, educator, and neighbor alike. Each morning our entire school community from Toddlers through Kindergarten gather together during FLAG CEREMONY to begin our day together. 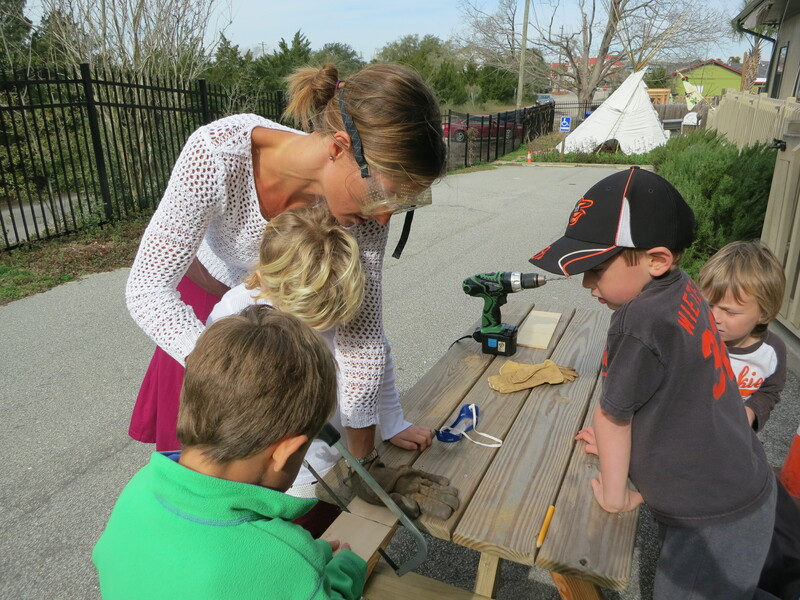 Each child makes her contribution to the group, they are guided by their leader, Megan Nordoff. The ceremony has become more than a mere gathering and transition of child to classroom, it has evolved into a meaningful ritual of togetherness and song. It is also a rich opportunity to share the values of our school and community culture, modeled first by Ms. Megan and soon taken over by the Kindergarten leaders. This morning, the Kindergarten students proudly display their hand sewn flag representing COMPASSION. They share through an originally composed song and, later, by leading a play, the meaning of the word COMPASSION as seen through the eyes of the five and six year old child. In her daily interactions, Megan values and models empathetic gestures and compassion. Her leadership by example, adds meaning to the song and rituals in place, affording the children an opportunity to internalize the concept. Likewise, as they venture into the community after school hours or upon graduation, they will continue to model compassionate behaviors- making a difference themselves with whom they come in contact. Ms. Megan’s leadership and practice inspire us to be fully present in each moment of our daily interactions and to value the routine. We hope you will be inspired as well to check out Three Ways Teachers Make a Difference – and also to vote for Megan Nordoff as a Kindergarten Leader in Education each day this week. Thanks for your support! A special thanks to our mentor, Jonathan Wolff, for his inspirational SELF-AWAKENED CHILD series offering stories and practical activities designed to cultivate an emotionally aware young learner. And, of course, to the photographer- David Vigliotti- for his beautiful photographs which help us articulate and advocate our practice outside the facility walls. And to the teachers, parents and extended Charleston community. Thanks for your support and keep on voting. We want that farm! Forming the fingers in just the right way to hold a pencil can be a challenge for some children with fine motor issues or poor muscle tone. Dr. Montessori recognized the need for the young child to build hand strength and to allow for the pincer grip to mature before offering the tool in an effort to prevent the student from developing poor and tiring form. Many of the materials in the Montessori classroom from Practical Life to Geography or designed in a way that promotes strengthening the hand and developing a proper pincer grip. Every opportunity he has to grip something small will help him strengthen the tiny muscles in his hand and give him more confidence with tools and eventually a pencil. Taking the time to build upon proper technique and the process will allow this student the opportunity to mature further. When his hand is prepared for the tool- in this case a pencil- we feel confident that the writing will unfold. Yet, the child is not left to mature on his own. Both parent and teacher collaborate to develop together activities at home and school which will assist him in building the skill. When it comes, he will most certainly feel the pride of “I did it”- as will those involved scaffolding him on his road to mastery.